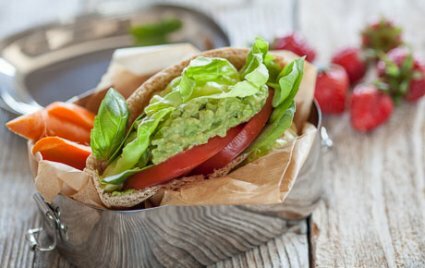 This juicy vegetarian lunch packs whole grain pitas with a mixture of greens, tomatoes and mashed avocado for a satisfying and colorful midday meal. Cut pita pockets in half. Stuff pita pockets with lettuce leaves and basil. Evenly divide avocado mixture between pita pockets, spreading it on the lettuce leaves. Add 2 tomato slices to each pocket. Per Serving: Serving size: 1/2 stuffed pita, 180 calories (70 from fat), 8g total fat, 1g saturated fat, 220mg sodium, 25g carbohydrates, (7 g dietary fiber, 2g sugar), 5g protein. Layering all the colorful ingredients of this salad separately in a glass bowl makes for a beautiful presentation. To make the herb pesto, combine basil, parsley, kale, garlic, walnut, vinegar, honey, salt and pepper in a food processor. Add 1 tablespoon water and blend until smooth. Cover and refrigerate. To make the salad, bring 2 cups water to boil in a medium saucepan. Stir in barley, lower heat and simmer, covered, until barley is tender and most of the water has evaporated, about 35 minutes. Remove from heat and let sit, covered 5 minutes. Transfer to a medium bowl and cool. In a large (2-quart) bowl, preferably glass, layer barley, beans, tomatoes, avocado and corn. Top with pesto. Toss at the table and serve. Per Serving: 360 calories (130 from fat), 14g total fat, 1.5g saturated fat, 140mg sodium, 50gcarbohydrates, (13 g dietary fiber, 8g sugar), 12g protein. An easy-to-throw-together, affordable stew that feeds a crowd. Top bowlfuls of this beefy tomato and corn stew with dollops of sour cream and spoonfuls of your favorite salsa. Per Serving: 310 calories (70 from fat), 8g total fat, 2.5g saturated fat, 35mg cholesterol, 820mgsodium, 42g carbohydrates, (9 g dietary fiber, 10g sugar), 20g protein. Cook potato in boiling water until very soft, about 15 minutes. Drain and cool slightly. Preheat the oven to 400°F. In a large bowl, combine potato, garbanzo beans, kale, oats, bell pepper, olives, parsley, onion granules and black pepper. Use your hands to break up chunks of potato and press the ingredients until they hold together. With damp hands, form into patties* about 4 inches in diameter and 3/4-inch thick. Place on a parchment paper-lined baking sheet. Bake 15 minutes, then flip burgers and continue to bake until lightly browned on other side, about 15 minutes longer. 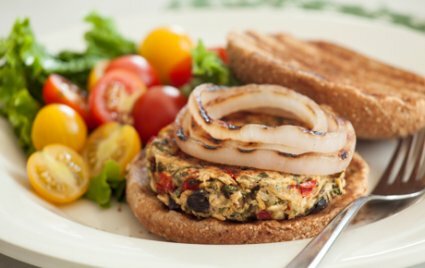 Per Serving: Serving size: 1 burger, 150 calories (45 from fat), 5g total fat, 300mg sodium, 23gcarbohydrates, (4 g dietary fiber, 3g sugar), 5g protein. What do you do with this mantra? You design your life using it as your guiding light, directing you both personally and professional-ly. When you have a decision to make – ask if it is in alignment with your mantra for the year. Put it in a place where you will repeat it as your mantra – on your phone, post-it notes, screen saver, 3x5 index cards, on your desktop calendar, etc.